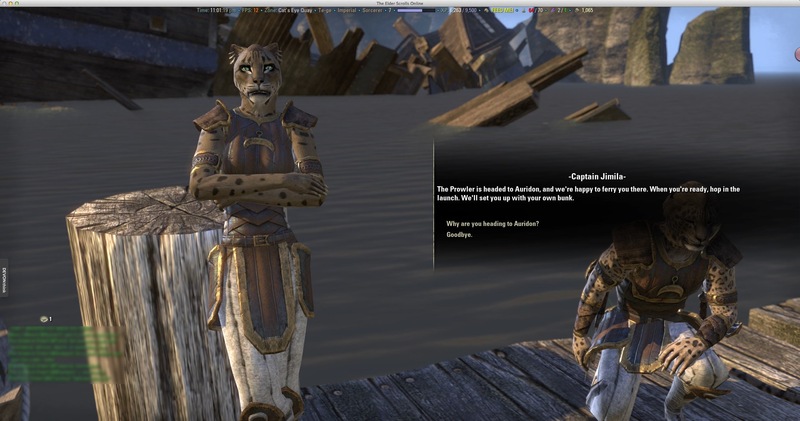 Note: For most people, clicking on the boat behind Captain Jimila will allow you to travel back to Auridon. For those of us whose quest is bugged, there is no message to click ‘E’ to travel or anything like that. 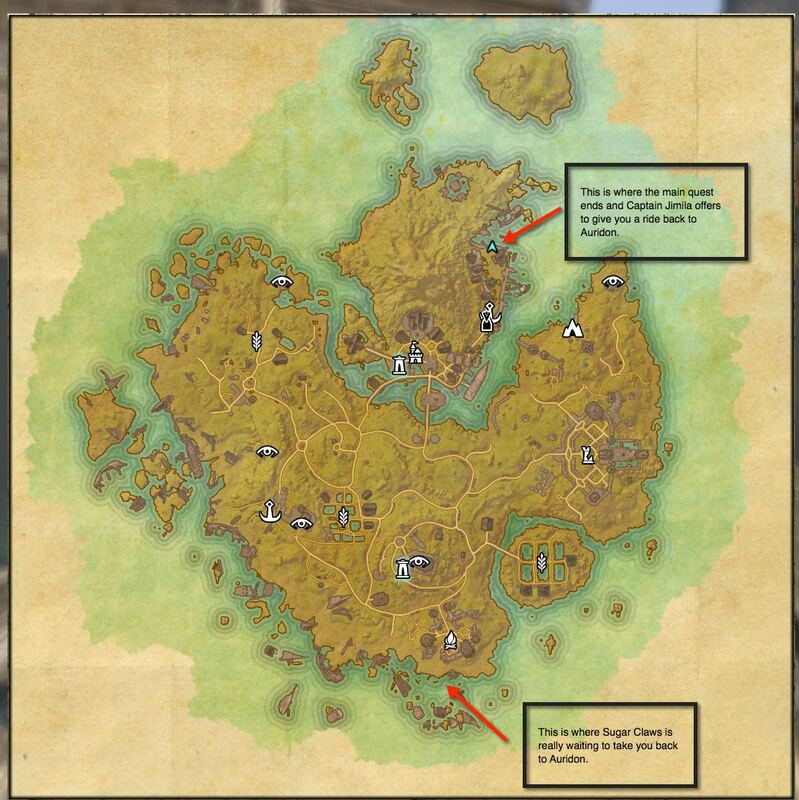 In fact, there’s no other quest on Khenarthi’s Roost and no clear direction on the “right” way to leave the island. If you’re like me and need the closure of leaving by boat to feel like you’ve completed everything there, this is how to achieve that. Khenarthi’s Roost, the starter island if you choose to be part of the Aldmeri Dominion, has some great quests, but one thing has bothered me every time I’ve played it. When you finish the main quest on the island, Razum’dar gives you your reward, and many of the characters from the other quests are all there to congratulate you, including the characters you met when/if you did the Shattered Shoals quest. In fact, the captain of the Prowler is standing there, with Raz and the rest to congratulate you and offer you a ride if you’re ready to leave. The boat behind her is almost impossible to get into though, there’s no gangplank to let you walk to it. The timing of your jump has to be almost perfect. Getting into the boat doesn’t do anything though. Even clicking on her after you get in the boat doesn’t start you back on your way to Auridon. In fact, until today I had never figured out how to return to Auridon except to use a wayshrine. And it bothered me. So yesterday I posted in the Psijic Order to ask if anyone knew what I was doing wrong. Thanks to their help, I finally realized that where you finish up in Khenthari’s Roost isn’t the end, even though it seems like it should be and the conversations sound like it is. Instead, you have to return to Sugar Paws, back where you first started on the island. I hope this helps anyone else trying to figure the “real” way to leave the island. And a big thank you to everyone in the Psijic Order who helped me finally solve the riddle that’s bugged me since we were in beta. 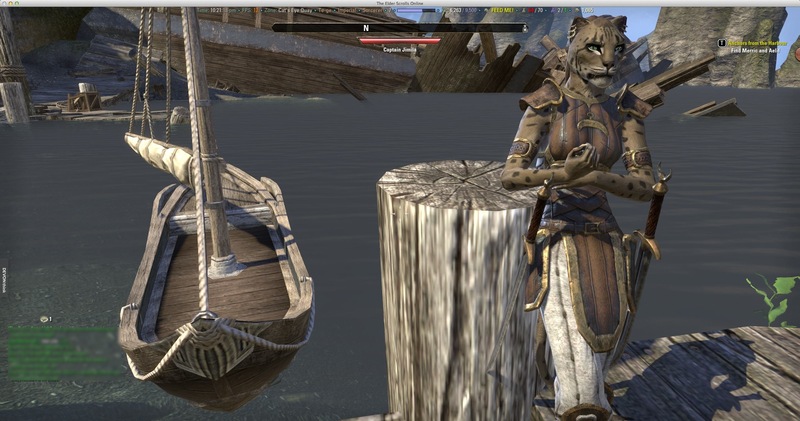 Actually you don’t jump on the the small boat at all, you can interact with the boat sail / mast while on the dock. This allows you to interact properly. Jumping on the boat will not allow you to properly interact with the boat and leave the island. You’re very right, SwampRat. What I didn’t realize until after I’d posted and shared this is that this quest is bugged in my game (and has been bugged since beta). In mine, there is no way to interact with the boat, either while standing on the dock or on the boat. Even Sugar claws is bugged and I cannot leave. Any OTHER suggestions?